Background: Human infectious diseases are caused by various pathogens including bacteria, fungi, viruses, parasites, and protozoans. These infectious agents are controlled by using synthetic drugs as well as natural sources. Objective: The aim of current study was to evaluate the antibacterial effect of Rumex hastatus against clinical bacterial pathogens. Methods: In current research antibacterial effect of Rumex hastatus was analyzed against seven clinical pathogenic bacteria such as Escherichia coli, Serratia marcescens, Streptococcus pyogenes, Staphylococcus epidermidis, Staphylococcus aureus, Klebsiella pneumoniae and Pseudomonas aeruginosa through agar well diffusion method. The boiled extract was used for the phytochemical screening, antioxidant potential, thin layer chromatography, bio-autography, and spot screening. Genomic DNA was extracted to find the DNA protection effect of R. hastatus. Results: Antibacterial results showed that diethyl ether extract has the maximum inhibition of S. pyogenes (9.66 ± 0.57 mm). Acetone and diethyl ether extracts showed moderate inhibition of K. pneumoniae (6.33 ± 1.52 mm and 5.66 ±1.15 mm) and S. aureus (6.33 ± 1.52 mm and 5.66 ± 0.57 mm). Similarly, chloroform extract indicated moderate inhibition of S. pyogenes (5.66 ± 1.15 mm). Ethanol extract had low or even no effect on the growth of bacteria. Genomic DNA extraction also encouraged the antibacterial effect of R. hastatus. Various phytochemical constituents such as ketoses, oligosaccharides, amino acids, amines, sugars, flavonoids, and antioxidant constituents were detected. 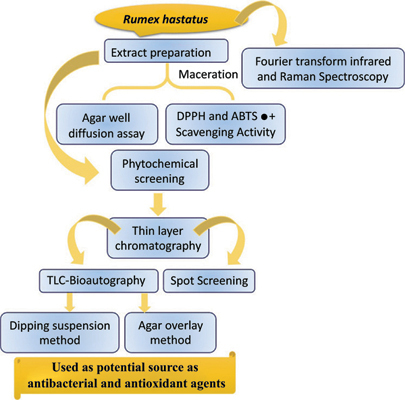 TLC-Bioautography and spot screening results revealed the potential use of R. hustatus as an antibacterial agent. Conclusion: It was concluded that most of the tested fractions appeared as an important source for the discovery of new antimicrobial drugs. Keywords: Bioautography, antibacterial activity, antioxidant activity, cytotoxicity assay, spot screening, DNA fragmentation, Rumex hastatus. Keywords:Bioautography, antibacterial activity, antioxidant activity, cytotoxicity assay, spot screening, DNA fragmentation, Rumex hastatus. Abstract:Background: Human infectious diseases are caused by various pathogens including bacteria, fungi, viruses, parasites, and protozoans. These infectious agents are controlled by using synthetic drugs as well as natural sources.